Occasionally Google Gmail user may want to reset the password which used to login into the Gmail account via web, POP3 and IMAP as the original password has been forgotten, or misplaced. Gmail credentials integrates and bases on Google Account. 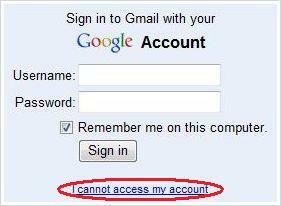 So changing the password for Gmail will also change the password for the associated Google Account. When trying to recover the Google Account password, try to do it from the device and web browser that you usually use to access the Google Account. Doing so will help Google to identify that you’re actually the owner to the account through the traces that you left behind. Go to https://mail.google.com/ (related: other Gmail access URLs). Click on I cannot access my account link. Click on radio button of I forgot my password, and then click on password recovery page link (or you can go directly to the link above). Enter the username for the Gmail or Google Account in the field provided. Enter the captcha letters as shown in the image on screen. If you never login to the Gmail for the previous 24 hours, a secret question as set in the Google Account will be presented. Answer the question with a correct answer in order to be able to reset the password. If you’re unable to answer your security question and the account has a secondary email address configured, a link will appear at the bottom of the secret question results page. Clicking on the link will has a password reset email message sent to the secondary email mailbox. After receiving the email, follow the link to reset the password. If you have login to Gmail in the preceding 24 hours period, the password reset email will be sent immediately instead. Follow the link to reset the password. If you don’t have a secondary email address, or if you no longer have access to that account, repeat the steps above after 5 days. At that point, you’ll be able to reset your password by answering the security question you provided when you created your account. If you cannot remember the answer to secret question, cannot answer the secret question correctly and do not receive password reset email in secondary email account, try to contact Google at http://www.google.com/support/accounts/bin/request.py?ara=1 for help.